Did you know Celebrity Cruises has a team of butlers onboard its ships? These European-style butlers are onboard to assist lucky cruisers sailing in suites. Here are some reasons why you may want to upgrade your stateroom to a butler suite. Want a board game to play in your suite? Need a dinner reservation? Shoes looking a little scruffy and need a shine? Check, check, and check. 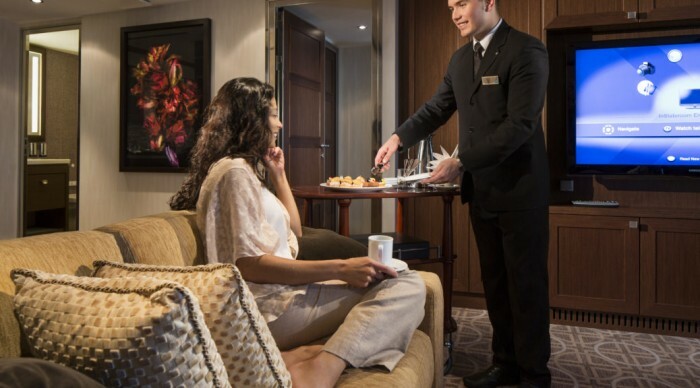 Celebrity Cruises’ butlers will take care of these needs and more while you sail the sea. Your butler will deliver tea and hors d’oeuvres to your room each evening for you to enjoy while you get ready for dinner. You can also arrange for your butler to bring you complimentary espresso and cappuccino if you need a pick-me-up at any point during your day. In addition, if you feel like a romantic dinner in your suite instead of one of the ship’s restaurants, you can order a full meal, which your butler will serve to you in your suite – or on your oceanview verandah. This option is also available for breakfast and lunch. Wondering what else is fabulous about sailing in a suite with Celebrity Cruises? In addition to the superior butler service, you’ll have access to the private gourmet restaurant, Luminae, which is only for suite guests plus access to swanky Michael’s Club, where you can get a well-crafted cocktail to enjoy before or after dinner. Enjoying a pint at Michael’s Club onboard Celebrity Cruises. The spacious verandah of the Penthouse Suite — it’s incredibly spacious inside, too! The (separate) bedroom of the Signature Suite. This entry was posted on Friday, June 24th, 2016 at 7:16 am	and is filed under Celebrity Cruises, Cruise Line, Destination. You can follow any responses to this entry through the RSS 2.0 feed.